The Cathedral, Temple MacDermot, Clonmacnoise. The Cathedral is the oldest church at Clonmacnoise dating back to 909AD and the largest pre-romanesque church in Ireland. 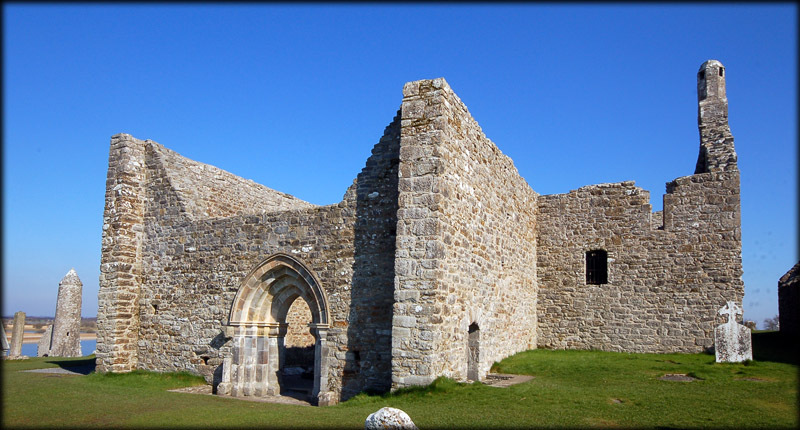 It was built by Flann Sinna (High King of Ireland 879-916) and Colmán (Abbot of Clonmacnoise). King Flann also commissioned "The Cross of the Scriptures " also known as King Flann's Cross. There were many alterations to the Cathedral over the years, but the original brown sandstone can still be viewed in the north wall. 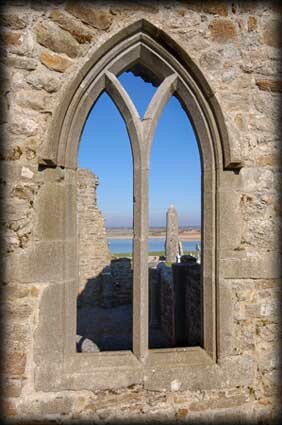 In the twelfth century a sacristy was added to the south, a window was added in the east and the beautiful transitional style west doorway was also added. This doorway pictured below, is also known as the Whispering Arch.. Monks would hear confessions there, they would stand on one side of the Arch and the penitent on the other whispering his confession, amazingly only the monk could hear them. 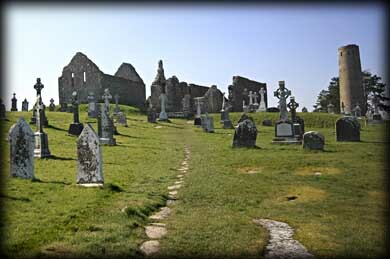 Also around this time Rory O'Connor, the last King of Ireland, was buried in 1198 near the altar. 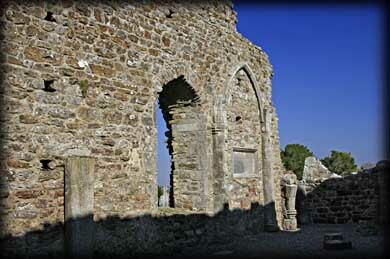 In the 13th century the south wall was demolished and rebuilt 2 metres northward, resulting in the west doorway being off centre. 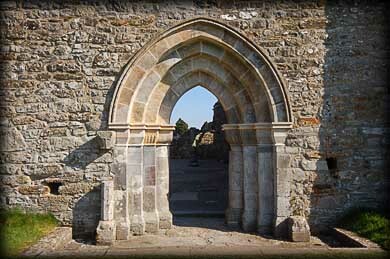 In the mid 15th century the beautiful north doorway was added. It is finely decorated with figures, from left to right of St Dominic, St Patrick and St Francis, each identified by an inscription above the entrance. 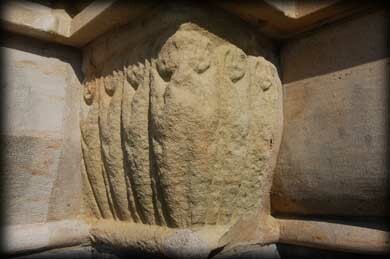 There is another inscription reading 'DNS ODO DECANUS CLUAN ME FIERI FECIT!' that tells us the doorway was commissioned by Dean Odo. There are a number of grave slabs leaning against the interior walls of the Cathedral but due to the strong sunlight and dark shadows we were unable to get good images of these. Situated: Very easy. As you enter the complex from the interpretive centre the Cathedral is directly in front of you. Discovery Map 47 : N 009 306. Last visit March 2011.